Someone told me I had lovely hair the other day and asked me how I got it so soft and shiny (no joke, this really happened!) - I simply responded "Diamonds darling!" Just kidding, but I totally should have! 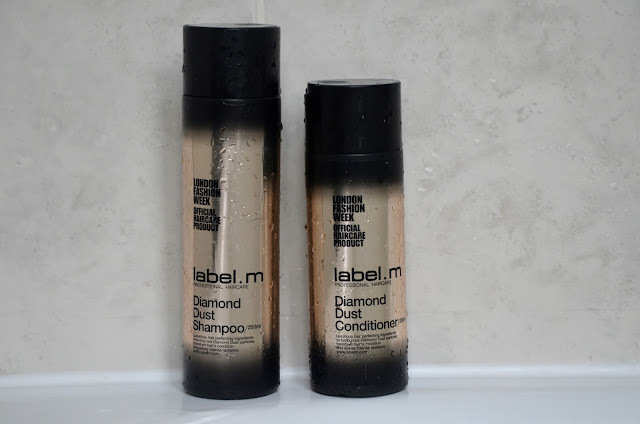 It was only the 2nd or 3rd time I'd used label.m Diamond Dust Shampoo & Conditioner, but after every single use, the results have been the same and I've been using it for a few weeks now... Shiny, manageable, soft hair that's super easy to straighten with just a brush & a blow dryer and doesn't get greasy for 3 or 4 days. These haircare products are a dream! I even took them away with me on holidays to a place where I know the different water normally wreaks havoc on my hair and I was surprised to see the same outcome. It was the first time I'd ever been away and actually had an easy time getting my hair to lay down and be nice without much time or effort. Results! The label.m Diamond Dust hair products feature an exclusive Micro-Diamond Complex which includes a blend of hair-perfecting ingredients and real diamonds to achieve body, silkiness and radiance in the hair. The formula is geared towards gently detoxing the hair and scalp, removing build-up and toxins. The diamond dust particles actually work to exfoliate the strands of hair! The shampoo also contains Champagne which cleanses the hair deeply and leaves it shiny. As if that's not enough luxury, the conditioner sets in shine-enhancing properties from pearls combined with white rose petal oils that strengthen, protect and hydrate. When I first received these products, I kind of thought the diamond dust idea might be a bit of a gimmick, but I'm very happy to be wrong... For luxurious hair this summer, the answer is quite simply this: Luxury. I'd definitely recommend trying these products if you color or highlight your hair, feel like you have a lot of product build-up, struggle with frizz or just want to combat summer sun damage. Champagne, pearls, diamonds and white roses - all a girl needs in the shower to have hair that looks like a million bucks! label.m Diamond Dust Shampoo is £20.25 and the Diamond Dust Conditioner is £22.95. Both are worth the investment in my opinion and if you're really on a budget, I would suggest using them maybe like once a week or twice a month as a sort of treat between uses of the shampoo & conditioner you normally buy just to combat the build-up and exfoliate the hair. For more information and to purchase label.m Diamond Dust hair products, click here.